I created this website for one of my friends from Full Sail. 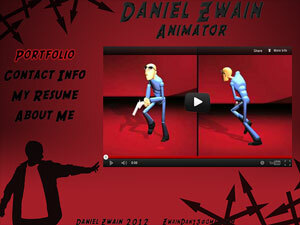 Dan is an Animator who graduated from Full Sail in May 2012. He currently lives in Hillsdale, New Jersey where continues to draw and animate. Dans website was ZwainKeyframe.com but it has since been taken down. For portfolio purposes, i am hosting it on my server, you can find it here.